It is important to identify spinal problems in children as early as possible so that corrective treatment can be applied early in your child's development. In fact, many afflictions found in newborns, such as colic and restlessness, can be traced to stress on the infant's spine and nervous system while in the womb and during labour. As your child develops, activities such as crawling, standing and walking and mishaps such as falling, can all effect his or her spinal alignment. 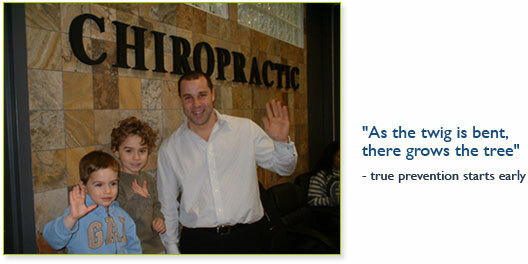 Chiropractic from day one!!!! With my youngest patient 2 weeks new, get your child checked ASAP. You would think most would start chiropractic care when starting to walk but chiropractors are nervous system doctors not just spine doctors. Before such signs and symptoms dis-ease or dis-harmony apear in your child, bring them in. Most just need a chiropractic exam. Some a small adjustment. Start early. Start right. By the time your child starts school, most children are involved in sports and gymnastic activities that put further stress on the spine as it develops. Even daily activities like carrying heavy backpacks or sitting, slouched over, in front of a computer can do lasting damage to your child's spine and result in poor posture later in life. Regular chiropractic checkups will ensure that any injuries or developmental problems are caught early to help improve the success rate of corrective treatment.